Ristorante Favoloso – Food. Boom. Location: Balkerne Walk, CO1 1PA- just off the top of North Hill in Colchester town centre. 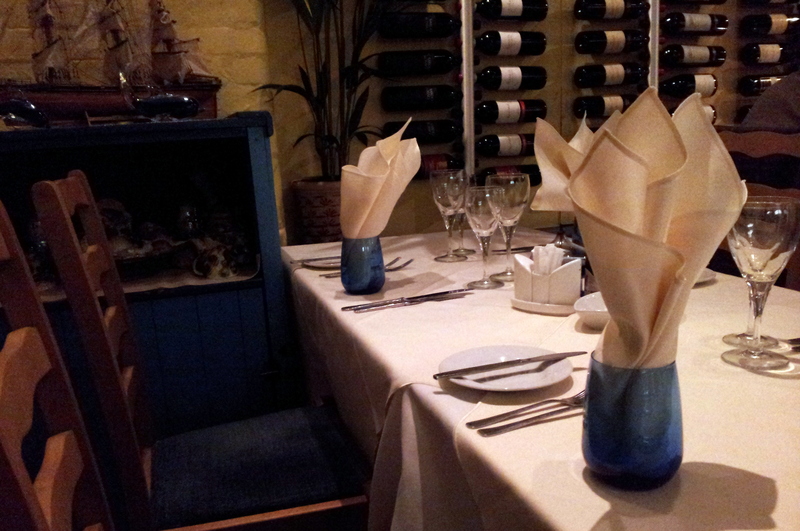 Really comfortable inside, basement level dining with gorgeous table settings and décor. Close to parking and public transport. Food: Generally very good, huge selection, great meat and seafood dishes. Good wine list, try the Fiano! Ambience: Lovely, friendly staff, a lively and comfortable Friday night venue. Pricing: Massive variance, check for availability of specials/set menus before booking. Lone girl’s view from the Fiano. Mid 90’s cinema fans may recognise the line “I don’t usually meet people. Unless I already know them.” I’m the same with new restaurants. There is nothing worse than paying more than a fiver for a dinner that you either A) Really don’t like or B) Could have done a better job of at home. I think a lot of people who consider themselves competent in the kitchen feel the same, it is soul crushing to spend twelve quid on a single plate of mediocre food when the same cash could have fed four of you very happily with lush leftovers from the comfort of your own kitchen. And you wouldn’t have had to put a frock on and do your hair. Believe it or not I often dread going out to eat, particularly in my home town. The options are reasonably plentiful, and heavily weighted with your average chain pizza or piri piri chicken outlets. Ok for a last minute choice on on voucher code day, but it’s Friday night, there are friends coming, and you need to choose the venue. Pop quiz, hotshot. What do you do? I did not shoot the hostage, I instead ruled out the usual suspects in a bold move and decided to look for somewhere either new or not visited for some time. I first decided on a family run Italian near to my office, then after some horrific trip advisor tales revised this, moved some distance uphill and booked Favoloso’s, table for six, eight pm, thanks very much. My main reasoning for this was a shining review from a day job colleague and a fantastic looking £22-95 set dinner menu. They are also rumoured to be one of the prime fresh fish venues in sunny Colchester, and seafood really is something of a treat. I have eaten here before, but probably not for about 12 years, so we’ll call this a new and shiny experience. On arrival, Ristorante Favoloso was pleasingly busy without being rammed, genuinely lively and atmospheric. Being the first of my group to turn up, I took to our table rather than hang out as billy no mates in the bar and enjoyed a really lovely Fiano whilst studying the menu. My new venue anxiety began to wane. It is a lovely setting, below street level with brightly decorated walls and lots of typically Mediterranean décor in the way of fish nets and old photos which are a little clichéd but hit just under the level of forced cheesiness. It feels authentic, or at least the way a bunch of Essex folk think an authentic Italian restaurant should feel. Not to say authentic means casual in any way, all the tables are impeccably set with heavy linen and lovely glassware, I particularly liked their blue glass oil burning candles. Lovely. Their front of house staff are equally beautifully turned out, helpful, welcoming and smiley. So far, so good. And now the return of the new venue anxiety as I looked through the available edibles. Firstly, the web advertised set menu did not exist and secondly the specials were all hovering around the same price per plate as I had anticipated paying for three courses. Yes, fine, I’m a bit tight, but in my defence I don’t have oodles of spare cash to be throwing about the place and I was responsible for bringing five other people here, people I wasn’t paying for. I sensed a dip in popularity, but the Fiano helped. Due to this pricing issue, we all opted to skip the starters, and collectively enjoyed three steaks, two different fishy pastas and a slow cooked beef. No one had any dinner complaints. The boy was quoted as enjoying ‘the best steak I’ve ever eaten’ (don’t tell his father in law) and I have to say the crab tagliatelle was fantastic- perfect fresh pasta with a creamy sauce where the crab was the star but didn’t overwhelm the other flavours. The pasta dishes were bountiful in portion terms, I struggled to the clean plate I left and my stomach muscles regretted for the next hour. The steak eaters enjoyed a mix of freshly cooked veg and potatoes (what’s Italian for dauphinoise?) and the slow cooked beef had a nice pile of rice with it. It is worth pointing out that the slow cooked beef eater, known to you as The Knitter, is of a similar mind to me about eating out and said that this beef was delicious and well worth it. So two recommendations for you there. All in all, I’m going to give Ristorante Favoloso a resounding seven, no eight, no seven, errr, seven and three quarters out of ten. My main grumble really is the pricing. Our bill came in at £34 a head for two courses where only four out of six were drinking and someone skipped dessert. You could put a dent in this amount if you went for one of the standard pasta mains, but to their favour the meat and fish selections are just too tempting. Am I scrooging? Maybe so, but although the food was good it wasn’t perfect- I don’t expect little bits of crab shell in my dinner somewhere like this. Even if there were only three, but still. Anyway, yes I heartily recommend this for a Friday night dinner and wine with friends job, do try the seafood or stay safe with a great steak.